Six years ago, Al-Mutanabbi Street in Baghdad, was bombed on March 5th, 2007 by Islamic extremists targeting the intellectual community and elite of Baghdad. Last week when I sat down with Jane Carlin, director of Collins Memorial Library, it was with the intent to find out and write about how a portion of the Al Mutannabi Street Starts Here exhibit, came to Collins Library at the University of Puget Sound. After returning home with my notes, I changed my mind and spent the rest of the afternoon on my patio reading a book Jane had lent me, Al-Mutanabbi Street Starts Here; Poets and Writers Respond to the March 5th 2007 Bombing of Baghdad’s Street of the Booksellers, edited by Beau Beausoleil and Deema Shehabi. Within a moment, Al-Mutanabbi Street had become real. Sitting safely in the sun on my patio, I became surrounded by the raucous noise of students, writers, and intelligentsia who gathered on this boisterous thriving street to visit the book sellers, market stalls, printers, stationers, and cafés as they had every day and as they had done for centuries to talk, buy, sell, or sit and read their newest acquisition. It was a safe street where Shiites and Sunni’s could meet over common ground; books. Rare books and manuscripts, Murder on the Orient Express by Agatha Christie, even forbidden books such as The Prince by Machiavelli could all be found and read without fear of retribution. Lounging in the sun, I met the people who had lived, worked, gathered, and died on Al-Mutanabbi Street. Those who feel intimidated by books will always threaten their existence. The destruction of books has been well documented. Libraries in Nineveh, Alexandria, Baghdad, and Berlin to name only a few and some of those more than once, have had their collections destroyed or their books burned. And of course, if the realities of life are too harsh, one can always turn to Ray Bradbury’s Fahrenheit 451 or Umberto Eco’s The Name of the Rose. The exhibit, Al-Mutanabbi Street Starts Here, is not intended to be a political statement. 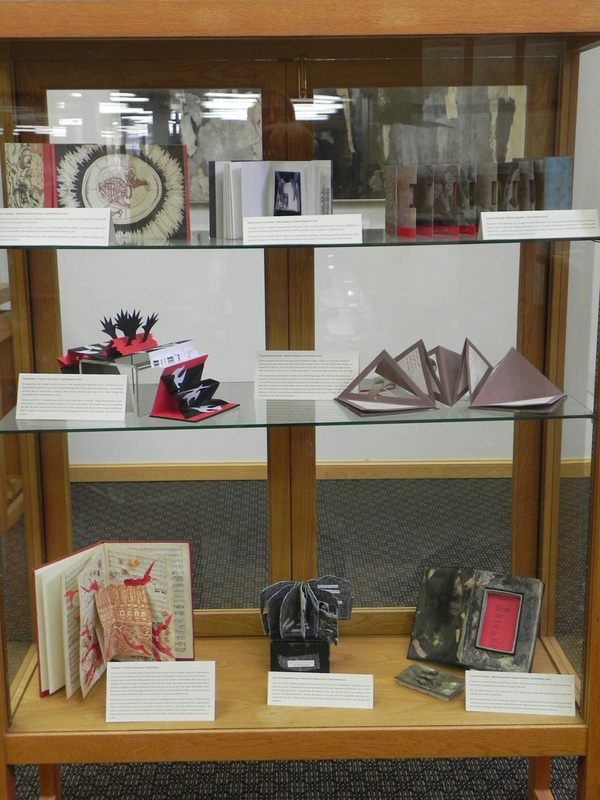 It is intended to be an exhibit emphasizing the fragility of books. Over 250 artists from around the world, including two members of Puget Sound Book Artists, Jessica Spring and Laura Russell were invited by Beau Beausoleil to contribute to this portion of the total collection exhibit which is divided into simultaneous exhibits around the world. 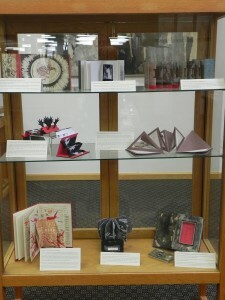 The exhibition at Collins Library is unique. At the end of the exhibition, one copy of each book will become part of the permanent collection of the National Library of Iraq in Baghdad.